An incredible S-Style guitar Mario debuted at the Amigo Nashville Guitar Show! I jumped at the chance to get this guitar in the shop after the Amigo show and all my expectations were outdone when it arrived! I'm a sucker for a black guitar with a 1-piece maple neck and although I'm usually not crazy about V-necks this one I find this Soft V to be very comfortable. Awesome, powerful sound and comfortable to play - this is one expressive and musical guitar! 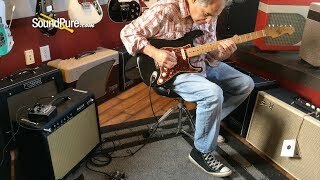 In this video, Sound Pure electric guitar specialist Eddie Berman plays the Mario Guitars S-Style Relic Black Electric Guitar #318318 through a 3rd Power Wooly Coats Spanky MKII Black/Wheat Combo with a Strymon El Capistan dTape Delay Effect Pedal. Since then, the S-style has become an American icon. Possibly one of the most recognizable electric guitar shapes, S-styles have graced the shoulders of Stevie Ray Vaughn, Jimi Hendrix, Eric Clapton, Jeff Beck and many, many more! In 1990, Mario entered the “Country Showdown,” a national talent competition sponsored by Tru Value hardware and GMC trucks. He finished as first runner-up out of more than 1,000 contestants. At this point, he was causing enough of a stir on stage that Nashville music executives took note and traveled to Georgia to see the young, budding country star. The “Country Showdown” led Mario to a record deal in 1991. His first record would come out on the now defunct Nashville-based DPI Records; a label that also included country music stars Hoyt Axton and Mel McDaniel. in 1996, Mario went to work at the Gibson Guitar factory in Nashville. Getting some much needed experience in a fast paced production environment. After three years of helping to produce literally hundreds of Gibson Guitars, he landed a building position with Fender Guitars. There at the newly formed Nashville based “Fender / Guild Custom Shop”, he honed his building and finishing chops. Working alongside esteemed master luthier, Evan Ellis, Mario absorbed every bit of knowledge possible on crafting guitars- start to finish. Following his career with Fender Musical Instruments, in 2004 he found himself in a management position with MIRC (Music Instrument Restoration Corporation) based out of Franklin, TN. Overseeing factory authorized repair work for Yamaha Guitars. One day in 2005, Mario called Shannon from work to tell her that he wanted to go out on a limb and start making his own brand of custom guitars. In the Spring of 2006, the Guitar Mill moved into its current location at 407 West Lytle St in Murfreesboro, Tenn.; a facility that has grown to encompass 4,000 square feet. The Guitar Mill has gone from offering two guitar shapes to now having more than a dozen body styles while also offering services such as repair, handmade necks, set-up, restoration, aging/relicing, customization, rerouting and custom Nitrocellulose finishing services . In 2011, a turning point appeared for the small custom guitar maker . The Guitar Mill Custom Shop became known under the new brand Mario Guitars® – replacing the former headstock logo with current “MM” inscription. The re-branding occurred when Mario felt the need to more closely associated with his product, thus naming it after himself. Mario Guitars® has been hailed for their superior playability, unmatched resonance and prolonged sustain. Many Mario guitars are the lightest guitars of their style, one of the major woods used is Paulownia, which is known for being incredibly lightweight while also maintaining sustain. Mario’s custom finishes and relic/aging work have been cited by many to be some of the best in this field. Mario is also proud of the fact that he also builds Non-aged / Factory New , guitars. “Not everyone is in to the whole “relic” thing- no problem, I’ll be happy to build you a guitar that is “showroom” new”, informs Mario. Mario Guitars® have been reviewed by Premier Guitar, Guitar Player, Guitar World, and have made appearance’s on stage with some of today’s top musical acts. In 2011, Country-Star Hunter Hayes started playing Mario Guitars almost exclusively; Hayes now owns four Mario Guitars®, one of which he played in his musical appearance in the 2014 Grammy Awards. Just recently, Grammy nominated country duo- ‘Brothers Osborne’ began endorsing Mario Martin’s talents, playing their ‘T’ Styles with pride! Total Weight of Guitar: 6 lbs 13 oz.